If you’d like to get closer to nature, then hiring one of our Canadian canoes or kayaks is a must! 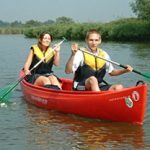 Available from a half-day to a full day, it’s a fun, quiet and affordable way to explore the waterways. If you’re really lucky you may see an otter, a kingfisher or even a marsh harrier, so keep your eyes peeled.